How do you sustain prayer over the long haul? How do you seek the Lord until… ? We want to be a people who seek the Lord until his plans, purposes, promises, and prophetic words are fulfilled. Jesus taught us to pray, “Thy kingdom come, thy will be done in earth as it is in heaven” (Matthew 6:10). The Lord also promised that his house, both individually and corporately, would be a house of prayer for all nations (Matthew 21:13). I use different tools to help me pray consistently and intentionally over time for the purposes of the Lord. 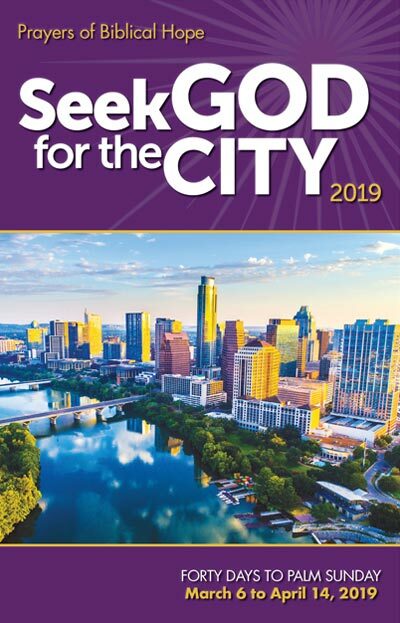 I have found that the prayer guide, Seek God for the City, is an awesome resource for prayer. The biblically-based prayers in Seek God for the City are written in a way that encourages and affirms this hope and certainty that God is accomplishing His purposes for the honor of His Son throughout all the peoples of the earth. God wants to stir our hearts so that we will wake up and pray beyond our comfort zone. Seek God for the City will help you focus your prayers outward toward what God desires to bring forth in our cities and communities. God loves for us to come to Him and ask for His kingdom to come and His will to be done. This is a great time to step out in faith, and trust God while keeping our hearts anchored in His word and promises. When you know you are praying the same prayers with many thousands of others, there is a sense of solidarity and community with believers all over the planet. The forty days leading up to Palm Sunday makes an ideal time to enter into a season of sustained, hope-filled prayer (March 6 – April 14, 2019). I want to encourage you to download the Seek God for the City app for use on your phone or tablet. Or, purchase a book online. We also have a few copies at Calvary for free in both English and Spanish. To sustain prayer over the long haul, I have found it helpful to use prayer guides like Seek God for the City. Another tool that helps sustain prayer is corporate prayer– participating in prayer together with others. I hope you will take advantage of whatever tools you can to help you pray faithfully, fervently, and hopefully in this critical hour.